ULYSSES, Kan. (KSNW) – Ulysses police said that several threats have been made against the lives of local law officers. 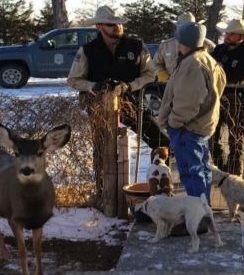 It was over a pet deer that was shot and killed by a game warden last month. Taryn Mcgaughey said the deer, Faline, her mom had cared for, for the past two years, was like part of the family and was shot and killed. Police said neither the Ulysses Police Department or the Grant County Sheriff’s Office were involved. The department said they will look into threats.